Please explain lap and loop counting. Depending on your child’s age category and related race course distances, he/she will need to complete a certain number of laps in each of the Swim, Bike, and Run portions of the race. The number of loops required will vary depending on the venue and the layout of the race course. The lap and loop information will be provided on Race Kit Pickup day. It is the athlete’s responsibility to keep track of their laps in the Swim portion of the race, though Volunteers will be on hand to also help count and keep track. For the Bike and Run portions of the race, it is the athlete’s and parent/guardian’s responsibility to keep track of the loops as they are completed. There will be a designated loop counting area marked by a sign on the race course. Parents/guardians may choose to stand in these designated areas or some other highly visible spot in the spectator areas alongside the race course. We recommend that parents clearly communicate with their children where they will be positioned to help them count their loops. Some parents/guardians make their own loop counting signs on pieces of paper with large numbers they hold up to help their child easily count and keep track. Can you describe a typical race day experience? When you arrive at the race venue, you will be directed to set up your child’s equipment in the Transition area, which must be done by their age category’s designated set up cut-off time. Your child’s age category’s set up cut-off time and their wave start time will be included in the information provided in the athlete Race Kit. After you have set up your child’s equipment in Transition, you may pass the time however you please until just before your child’s wave start time. We advise that children wait by the designated Swim area 15-20 minutes in advance of their wave start time to avoid any confusion. If your child is in the 3-5 age category, you will be enjoying this exciting experience within an arm’s reach of them at all times. When it’s their turn, all athletes in your child’s wave will be led to a marshalling area near the pool where Volunteers will give them a chip-timing anklet to be worn for the duration of the race. Once on the pool deck, the athletes will be given a short briefing about the rules for the Swim portion of the race by the Pool Captain and then directed to safely enter the pool and hold on to the side before the race begins. Then, get ready for the fun as the children complete their Swim distance! Once done the swim, the children will enter the Transition area to put on their running shoes and bike helmet before safely walking/running their bikes to the Bike course. They’ll complete their Bike distance before entering Transition again to leave their bike and start the Run. The race finishes with the Run distance before ending with the children crossing the finish line. Family and friends are encouraged to cheer athletes along and especially as they cross the finish line and receive their participant medals. After the race ends, be sure to spend time in our exciting Fun Zone, where families can enjoy a variety of post-race activities and treats. Athletes are given a water-proof, Velcro-strapped, chip-timing anklet by Volunteer Crew members prior to entering the pool area to begin their Swim portion of the race. The anklet is to be worn for the entire race and will be removed by Volunteers upon crossing the finish line. Timing results are available after the race through the race information page. All athletes are placed in groups or “waves” broken down by age category. In wave start events like KITCan’s Triathlons, smaller groups of athletes begin the race every few minutes. Each wave has a staggered start time to ensure that the race course is not congested and so that athletes can move safely through the course. How long are the race course distances for kids? Triathlon is an exciting, fast-paced, three-sport race, which takes place in the following order: Swim, Bike, Run. It’s a fun way to get fit and have fun! 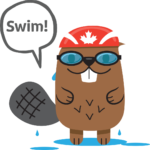 GOTRI.ca is a resource website created by Triathlon Ontario specifically for beginners and new entrants in the sport of triathlon, duathlon and other multisport events. Triathlon Ontario is a non-profit organization that is the recognized Provincial governing body for Multisport in the province of Ontario. Our mission is to provide leadership and governance for the development of a safe and fair environment for Multisport in Ontario. Triathlon Ontario oversees the sanctioning of races and clubs and undertakes a number of duties and responsibilities on behalf of athletes at every level, coaches, clubs, officials and race directors to ensure the growth and development of the sport in a fun and safe way. Do I need to get into the water with my child? 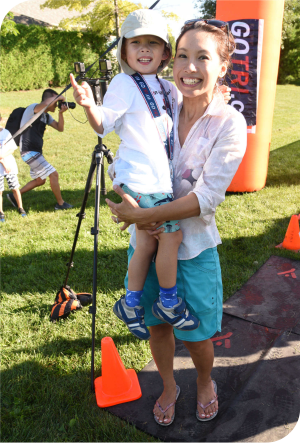 If your child is in the 3-5 age category, you must be within arm’s reach of your child during the Swim portion of the race and provide them with whatever assistance needed to complete the distance. The 3-5 age category is the only group that requires a parent/guardian to enter the pool. What should my child wear for the Swim portion of the race? Athletes need only wear a swimsuit. Can my child use his/her own flotation device? No. Pool facilities will have PFDs (personal flotation devices) available for athletes upon request prior to entering the pool. What type of bike can my child use? Athletes are allowed to use “Big Wheels”, tricycles, balance bikes, or bikes with training wheels, as long as the equipment is in good working order. If you are unsure about the condition of your child’s bike, we recommend having it inspected by a professional bike shop. When does my child need to start wearing his/her bike helmet? Athletes must put on their bike helmets with chin straps fully buckled in the Transition area and wear them when in contact with their bikes. Helmets must be worn until the moment the athletes dismount their bikes and hand them to Volunteers to be placed in the Bike Drop area before staring the Run portion of the race. What type of shoes should my child wear? Closed-toe running shoes are the only footwear permitted. The Transition area is located outside and near the exit from the pool where athletes go immediately upon completing their swim. It is a secured area in which athletes set up their equipment and personal items needed for the Bike and Run portions of the race prior to the start of the race. Athletes will be given designated times by which their equipment and personal items must be set up in Transition on Race Day – designated times will be listed in Race Kits and on signs on Race Day. Pre-race, all athletes and parents/guardians are allowed in the Transition area during their designated set up time. During the race, for the 3-5 age category, parents/guardians must accompany their child in Transition. For age categories age 6 and up, only athletes and Volunteers are allowed in Transition. Volunteers will assist athletes as needed during the race (i.e. tying shoe laces, buckling bike helmet chin straps, etc.). What items should be set up in the Transition area? What kind of equipment does my child need to participate? The only equipment needed is a bike and helmet for the Bike portion of the race. Helmet: Athletes must wear a bike helmet with a fully buckled chin strap. Bike: Athletes are allowed to use “Big Wheels,” tricycles, balance bikes, or bikes with training wheels, as long as the bike is in good working order. If you are unsure about the condition of your child’s bike, we recommend having it inspected by a professional bike shop. Recommended: Water bottle, towel for Transition. What clothing should my child wear? Athletes start the race in their swimsuits. As their torsos must be covered for the Bike and Run portions of the race, athletes whose swimsuits don’t provide full torso coverage should have a shirt ready to put on in Transition with the bib number from their Race Kits pinned on the front. Some children may wish to also put on shorts over their swimsuits in Transition. How do I register for a KITCan Triathlon? Registration is available through this site only. Click here to register now! What if we can’t attend the race we registered for? The registration fee is partially refundable (50% less processing fees) up until 14 days prior to the event. If there is room in another event an entry may be transferable. An entry is non-transferable to another athlete. Click here to submit a Race Transfer Request or Refund Request. What is a Race Kit? A Race Kit is a packet of information that includes the athlete’s bib number, Transition set up time, wave start time, plus information and goodies from sponsors. When and where can I pick up my child’s Race Kit? We recommend that Race Kits be picked up on Race Kit Pickup Day, which is held at the event site the day before Race Day. Race Kits can also be picked up the morning of the race at the event site. Check the Race information page provided for each venue for Race Kit Pickup Day time and location. What happens if it rains during the event? If heavy rain causes the course to be unsafe for the Bike portion of the race, we will still proceed with the Swim and Run portions of the race. What happens if there is a thunderstorm during the event? If there is lightning, the race will be halted or the start delayed until 30 minutes after the last flash of lightning. What happens if the race is cancelled due to inclement weather? If the race is cancelled due to inclement weather, athletes will still be given the items included as part of registration, namely: Race Kit, KITCan t-shirt, participation medal. Unfortunately, we are not able to offer refunds, rain dates or transfers to another race if the race is cancelled due to poor or unsafe weather conditions.